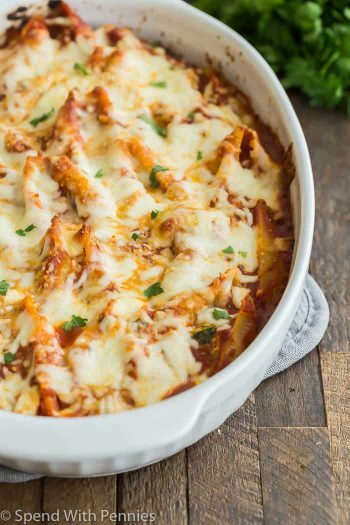 This is an awesome pasta recipe that the whole family will love! 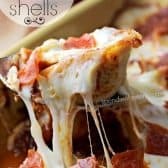 These pizza stuffed pasta shells are filled with a beef and pepperoni filling topped with mozzarella cheese and more delicious pepperoni! 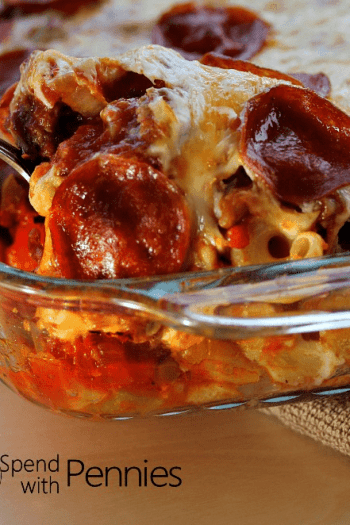 This bakes up delicious with a gooey cheesy topping! Using a high quality pizza sauce makes a big difference in this recipe. Eden Brand is my favorite one, it has a great fresh flavor and I usually buy it in a can. Most grocery stores carry it (and it’s sometimes in the organic area). 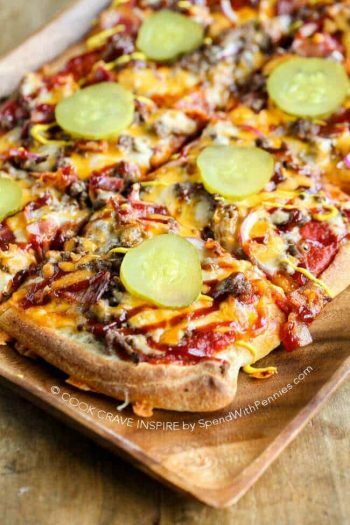 I added green pepper & pepperoni to this recipe because those are toppings we like… if you have other toppings you love, this recipe is extremely versatile… substitute sausage for the beef, throw in some mushrooms or olives, replace the pepperoni with ham! Make this your own… I’d love to hear your ideas! Preheat oven to 350 degrees. Cook shells el dente according to package directions. Drain and set aside to cool. In a medium pan, brown ground beef, onion and garlic until no pink remains. Drain any fat. Add 3/4 of the pepperoni and cook about 3 minutes. Finally, add in green pepper, oregano and tomato. Cook about 3 minutes or until green pepper is slightly softened. Remove from heat and stir in 1/2 cup of mozzarella cheese. 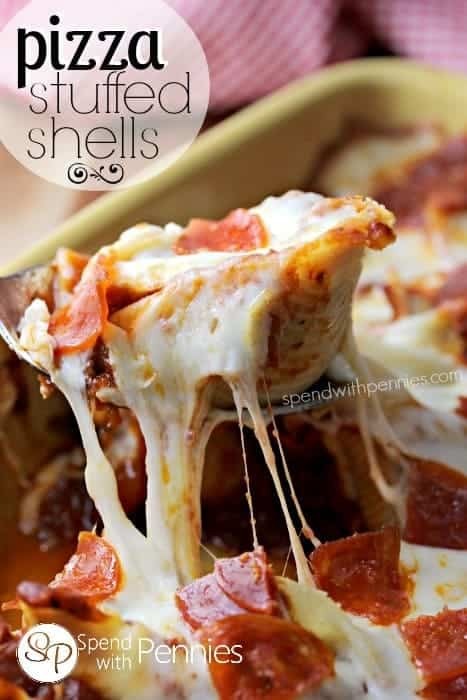 Fill each shell with the pepperoni mixture (approx 1 1/2 tablespoons) and place in a baking dish. Top with pizza sauce. Cover with foil and bake 20-25 minutes or until heated through. 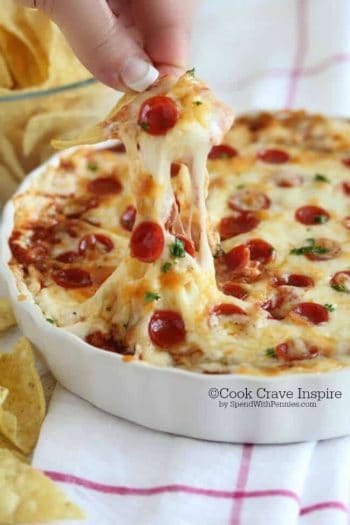 Remove foil and add remaining mozzarella cheese and remaining pepperoni. Return to oven until cheese is melted and bubbly. You should say at the top of the recipe how many people this feeds. I had to scroll the comments to figure it out. We are a family of five so I usually need to double the recipes. I will be making this tonight. I can’t wait to see how it turns out! You can also find the yield in the recipe card. Let me know how it turns out! Made these tonight, we thought we were eating pizza. Definitely a keeper. Next time I’m going to add sliced olives. I think olives sound like a great addition! Kids loved it and we enjoyed it as well. Will make again. Yes, this recipe can be frozen before baking. This is my 4th year making these for our school’s football team. The players and coaches LOVE this recipe! The first year I tried it with the optional green peppers, but that did not go over as well so I have left them out subsequent years. I typically add Italian sausage and pepperoni to my shells. It is always a huge hit! Making this for a large group is time consuming… but SO worth it! We used ground turkey instead of beef and cut back on the cheese on top. This turned out DELICIOUS! One batch of these isn’t enough, so we doubled it and had it for two meals. Thanks! I’m so glad your family enjoyed it Autumn! how many people does this meal serve? Could I prepare the night befor? Bake next day? Most definitely! I would recommend taking it out of the fridge at least 30 minutes before baking. LOVE THIS! Thank you! We are addicted! I prefer sausage over the hamburger. I’ve added mushrooms, olives, Canadian bacon…so fun to play with this recipe! Thank you again!! My husband doesn’t like pizza sauce/marinara sauce. Any type of other sauce i could use? You could try it with your favorite type of sauce such as an alfredo but I have only tried it as written. Looks very yummy. What brand of pizza sauce do you call a good quality brand? Also that goes for a good for a Pasta/Spaghetti sauce. Help me!! My two personal favorites are Costco’s Kirkland Marinara and Newman’s Own. What would be good side items to go with this? It’s on my menu plan for Thursday night. I serve it with a tossed salad and either fresh french bread or garlic toast. These were delicious! My husband loved them, and they were pretty easy to make. I will definitely be making this again. So glad you enjoyed them Meagen! I made this tonight, I used turkey pepperoni and ground venison. I also added fresh baby spinach in with the bell pepper, it was so good! Made this for supper yesterday and it’s all gone!! It was delicious!! My family is demanding I make it again Monday! Haha. I did everything the same as the recipe except added a BUNCH more cheese. My family are cheese addicts. :P Thanks for the great recipe! Wow!! YUM! Thank you bunches for linking up and partying with us! Pinning this! Holy cow these look tasty! I am going to have to put them on next weeks menu! 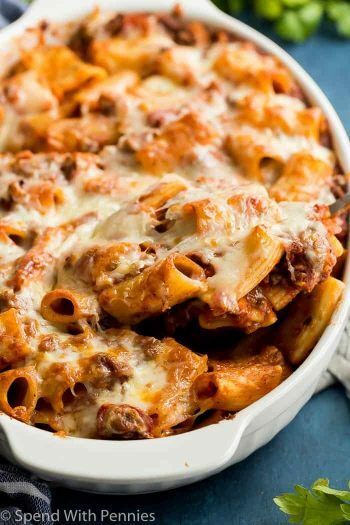 Holly, my boys would LOVE this for dinner… every night, pinned! LOL, it is a kid pleasing recipe for sure! Thank you for stopping by Gloria!! Your Pizza looks fantastic, Holly! Thanks so much for sharing this awesome recipe with Full Plate Thursday and come back soon! I used italian sausage ~ delish !!!!! Just made these tonight and were good. Next time I’ll probably add more Italian seasoning to the meat. I guessed at the oven temp since I couldn’t find it in the directions. 350 degrees seemed to work great. These look great and easy to do! I think we will be trying this real soon!